From Fort Garland, take US 160 west until you reach CO 150. Take CO 150 all the way to the park. Out early at the Great Sand Dunes National Park and Preserve, the creek that runs in front of the dunes was mostly dry but in certain areas the water was iced over. 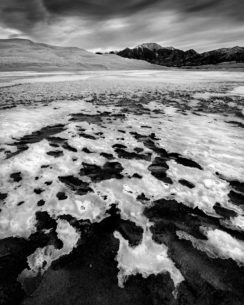 I found this patch of broken ice and the patterns plus having the Great Dunes and the Sangre de Cristo Mountains in the background made for a really interesting image. I also had to step very carefully not to destroy any of the ice!